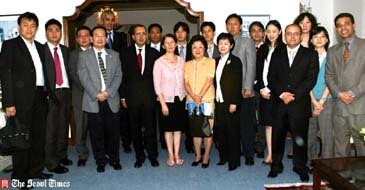 Tunisian Ambassador to Seoul Moncef Baati (sixth from left) poses with the guests at his residence in Seoul. 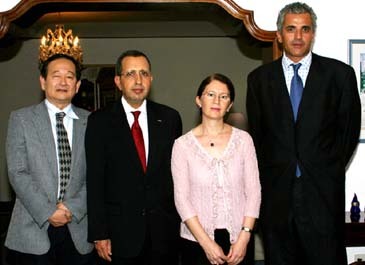 In a continuous effort to promote Tunisian Tourism, Tunisian Ambassador to Seoul Moncef Baati hosted a reception at his residence in Itawon, Seoul on Sept. 20, 2006 with the presence of Mr. Kamel Lagha, president of Atlantis Voyages, a major tourism company in Tunisia. The reception, which started at 5:30 p.m. and lasted for about three hours, drew a number of distinguished guests from the press media community and the professional of the tourism sector operating in Seoul. Among the guests were Mr. Lawrence Liew Kok Cheon , area manager Korea of Qatar Airways and Chun Kil-Hee, chief executive of Abia Atelier, Ms Ahn Sung-Youn of Incredible India's marketing & Communications Department, Mr. Kim Bum-Suk, manager of Junggrau, a travel agency specializing in Europe. During the reception distinguished guests enjoyed a short movie over Tunisia, before being briefed by the Tunisian ambassador on the rich and diversified natural, historical and cultural assets of Tunisia. It was also an occasion for the gathering to discuss possible ways and means to promote Tunisian tourism in Korea. With more than six millions and five hundreds thousands tourists annually visiting the country, Tunisia is the first tourist destination southern of the Mediterranean. Located at the core of the Mediterranean Sea, with 1,300 km of coastline, the country offers to its visitors a great deal of diversity: a Mediterranean climate in the north, an arid tendency to the south where it becomes a Saharan type. Hence, the highly contrasted landscape: forests in the north, steppes in the centre, and desert and oases in the south. Due to its geo-strategic location in the Mediterranean Sea between Africa, the Middle East and Europe, Tunisia was in the forefront of history. It was for more than 3000 years a crossroads for brilliant and diversified civilizations: Berber, Punic, Roman, Byzantine, Arab, Spanish, Turkish, French and a welcoming homeland for Jewish, Christian and Muslim Communities living together in peace and harmony. Offering new and modern facilities with the best quality – price ratios services, Tunisia traditionally known for its sunny whether and beautiful sea, has further implemented during the recent years a strategy aiming at diversifying its tourism product. Tunisian Ambassador to Seoul Moncef Baati (second from left) poses with Mr. Lawrence Liew Kok Cheon (left) , area manager Korea of Qatar Airways, and Mr. Kamel Lagha, president of Atlantis Voyages. Second from right is Mrs. ambassador. •	Health tourism, which is already the principal magnet for many tourists. With 25 Thalassotherapy centers — medical treatment with seawater, today Tunisia is amongst the top world destinations for this cure. •	Sport tourism, with nearly twenty modern courses along the country, golf tourism is another potential niche which attracts a wealthy clientele from all over the world. The next few months will witness the opening of unique golf course located in the deepest desert. travellers can also enjoy several kinds of sport activities including sailing, windsurfing, water-skiing, horseback riding. •	Cultural tourism, Tunisia has an exceptional and historical treasures, including over 20 000 archeological sites and hundreds of monuments, museums and historical centers and a total of eight world heritage sites. 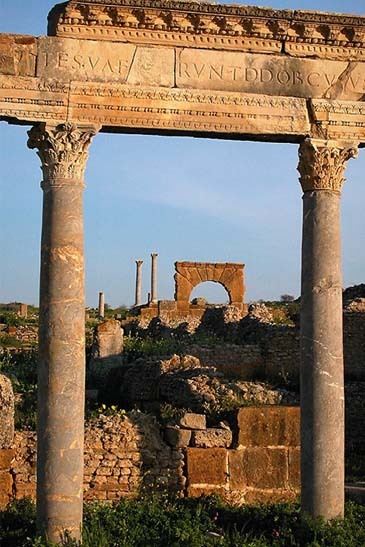 The most frequently visited are Carthage, Bardo Mesum (hosting the world largest mosaic collection), El Jem Coliseum and the Kairouan mosque (the first mosque built north of Africa). •	Saharian tourism, Tunisia is practically among the few countries in the world which can offer its visitors the impressive Sahara desert within easy reach of beautiful beaches, thickly-forested mountains and bustling towns and cities. The Sahara covers third of the Tunisian territory. The northern part contains human settlements in traditional urban agglomerations, mountain villages and oases. The further one travels south, the more defined the Saharan character becomes. Apart from protected species of wild flora and fauna, the deep southern region has very few human traces - wells for the survival of nomads, old caravans and fortifications. •	Eco-tourism, from north to south, many national parks and natural protectorates have become privileged observation sites to protect species reproduction and several plants, including some rare ones. A safe country and a tolerant people, Tunisia is only one or two hour flight from most European capitals with no visa required for Korean friends.